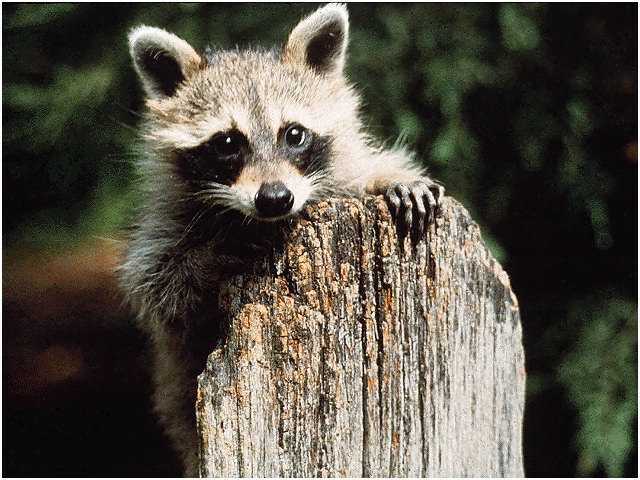 Called the masked bandit, this intelligent, highly curious animal is an agile climber that can open doors, open refrigerators, and routinely uses doggy doors to access peoples homes. 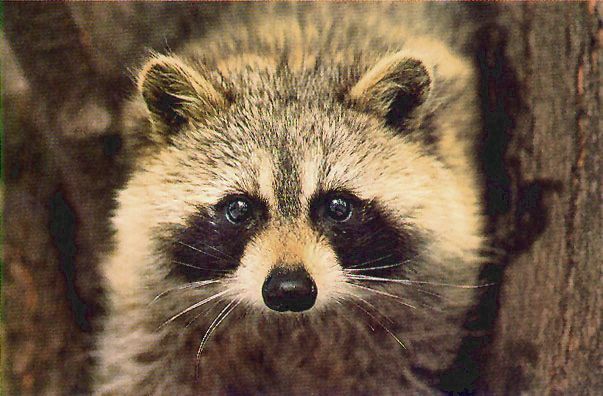 Also known to climb into peoples fireplaces from the chimney stack above, it is an extremely strong, ferocious anuimal that will attack if provoked. 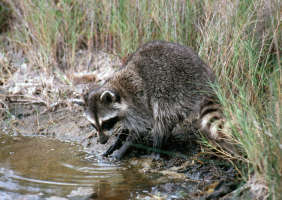 Normally nocturnal, approximately 2 to 2 1/2 feet long, with a bushy, ringed, 12 to 17 inch tail. Fur mostly gray with a black "mask" around the eyes. Can weigh between 12 to 48 lbs. Mates January thru March with a litter of 1 to 8 born April thru May. A favorite den site for raccoon mothers is in the fireplace above the damper. Normally walks, but can run, swim, and is an excellent climber. It is omnivorous, and will routinely eat dogfood and catfood if left outside, KOI fish from landscape ponds, and will raid garbage cans in search of food. Appears to wash its food when near water. But this is actually its way of making food softer for consumption by making it soggy. Commonly infests attic and will tear open fascia boards at rooflines to enter homes at that point. Vocalizations include purrs, whimpers, snarls, growls, hisses, screams, and whinnies. Has also been know to tear up lawn sod in search of grubs. 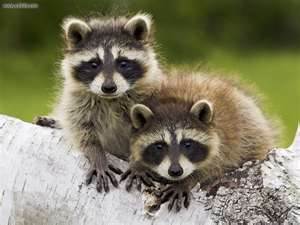 This animal is a known vector of rabies and it contamintes soil with its droppings that carry the deadly racoon roundworm which is often fatal to humans. 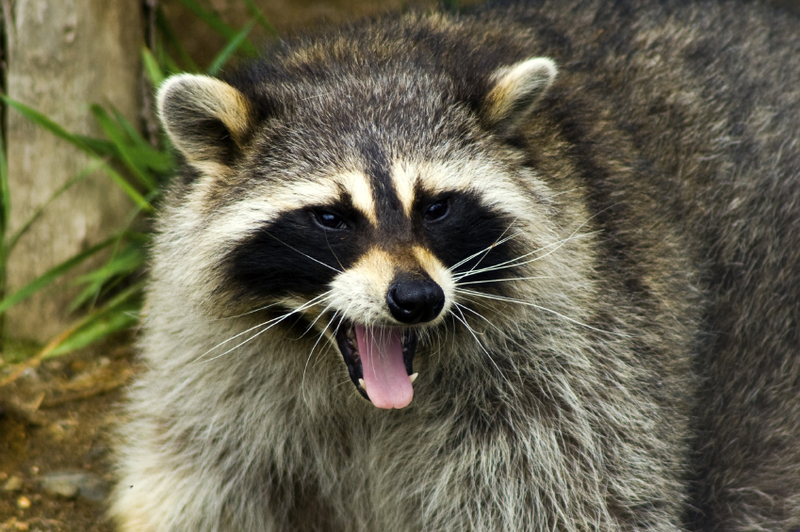 ACE SERVICES PROVIDES TRAPPING, REMOVAL, AND EXCLUSION SERVICES FOR RACCOONS IN BENTON, BOSSIER CITY, BLANCHARD, DOYLINE, ELM GROVE, GREENWOOD, HAUGHTON, KIETHVILLE, MINDEN, MOORINGSPORT, SHREVEPORT, STONEWALL AND THE SURROUNDING TOWNS. garbage cans tipped over at night?